Even the most seasoned interior designer can sometimes find it a bit challenging to perfectly execute one design style in a home – so what about three different styles under one roof? That is what experienced architectural firm Coupedeville, based in London, decided to accomplish with one of their townhouse creations. Before taking on the interiors, we first need to take in the exterior façade of this exceptional house. From this angle, we see a picture-perfect example of industrial design (with light touches of the modern style here and there) peering out from the inside, framed by eye-catching texture of brick walls. This, together with the old wooden planks on the terrace that seem to have been worn out a little over time, contrasts so delightfully with the fresh interiors. Ready to see what the interiors have to show us? We’re through that generous glass door and in the light-filled kitchen and dining area, both neatly decked out in the industrial style. 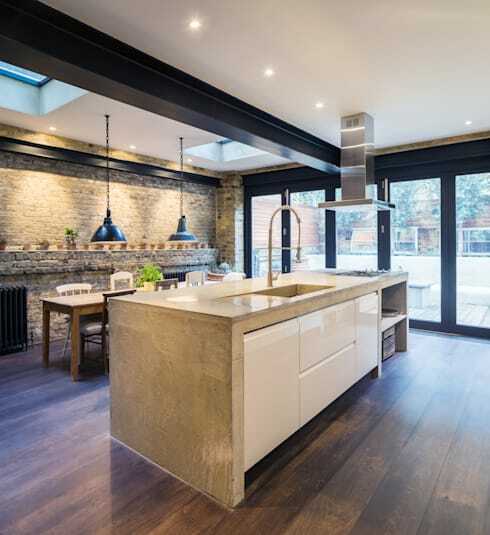 Low-hung urban lamps; a concrete kitchen island; exposed black lacquered beams… what’s not to love here? On the other side of that magnificent island we get a clearer view of the kitchen’s well-hidden storage spaces (just because it’s not modern doesn’t mean it can be cluttered, you know!). But this island is so much more than a working spot; it’s also a sculptural marvel that acts as a partition between the two areas. 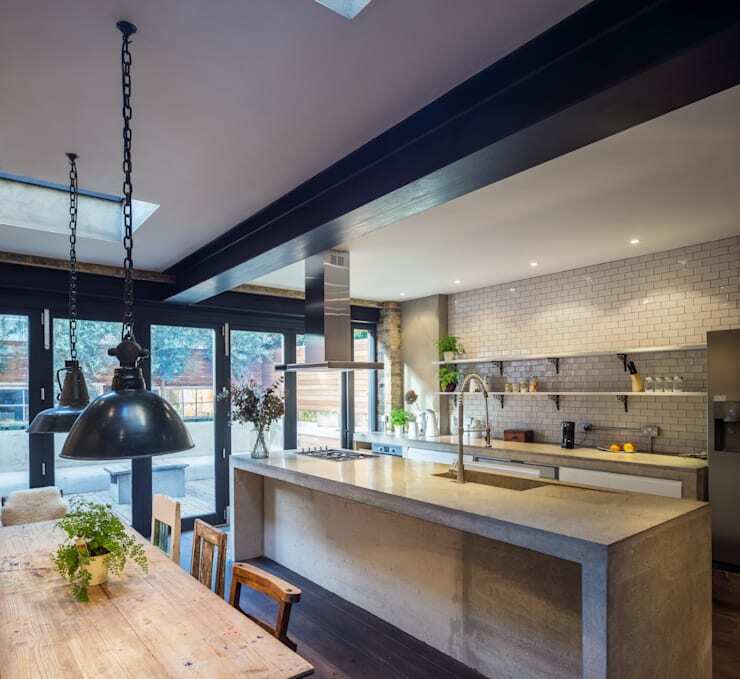 As for the dining area, it is beautifully illuminated from various angles: skylights, ceiling lamps, and natural light streaming from outdoors on the right. All of these will no doubt add to the delight and charm that is sure to be experienced by the diners with each and every meal. 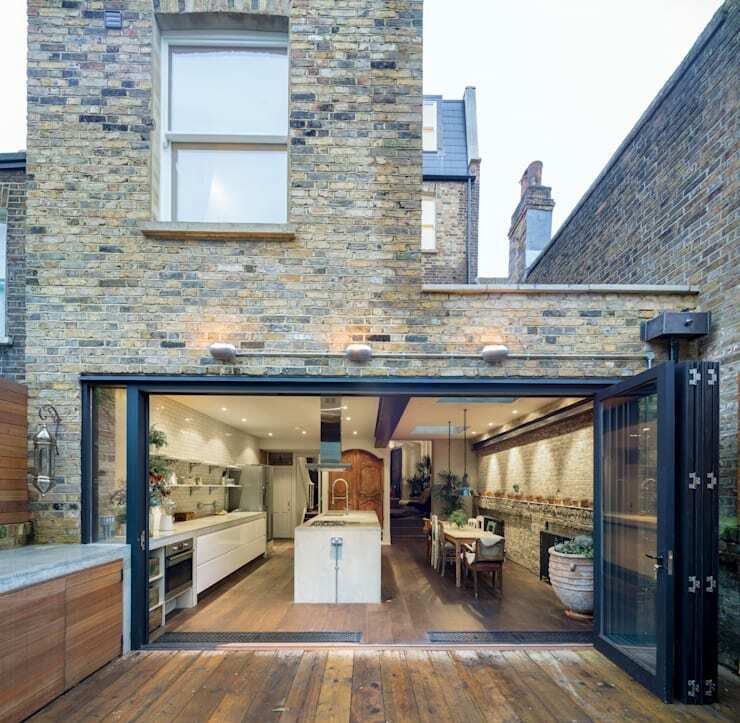 Notice how the exposed brick wall in the back adds eye-catching charm and character to the entire open-plan space; a delightful echoing of the exterior façade, if you will. On to the living room, where the interior style does a complete switch around. 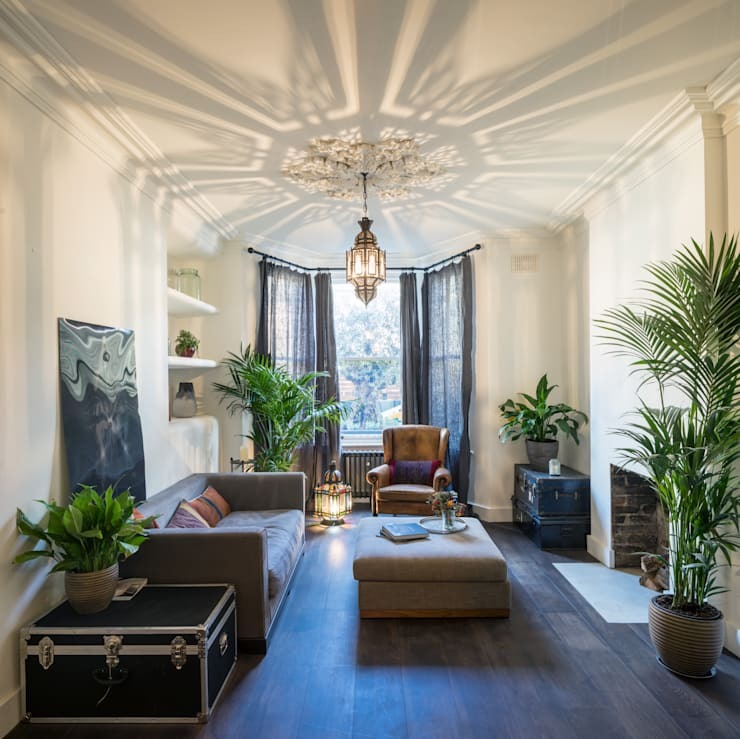 The elegant contours of the ceiling and bay window give this room a very distinct classic shape, yet the designers have opted for an exciting and eclectic touch in terms of décor and furniture. Notice how the fireplace, sofa and retro chairs have all been positioned in a traditional sense, yet with a brilliant combination of decorations and colours. The freshness of the white walls contrasts strikingly with the luscious greenery, which is then complemented by the warm timber floorboards and richly coloured furniture. Our favourite pieces here? Those lighting elements which touch on the Art Deco style and provide the final eclectic touch in both ambience and decoration to the room. The eclectic style worked out so well in the living room it was decided to bring it back for the more private bathroom space. 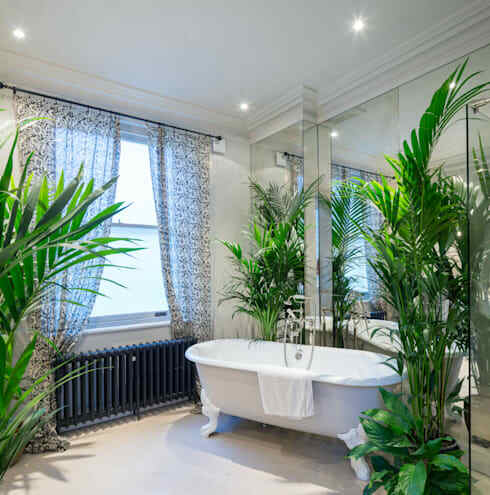 Those patterned curtains, in conjunction with the fresh potted greenery, take care of the look-at-me elements in the room, while floor-to-ceiling mirrors behind the classic tub do an amazing job of dispersing the available light cleverly around the space. As we draw nearer to the sleeping quarters of the house, the design style undergoes another transformation. 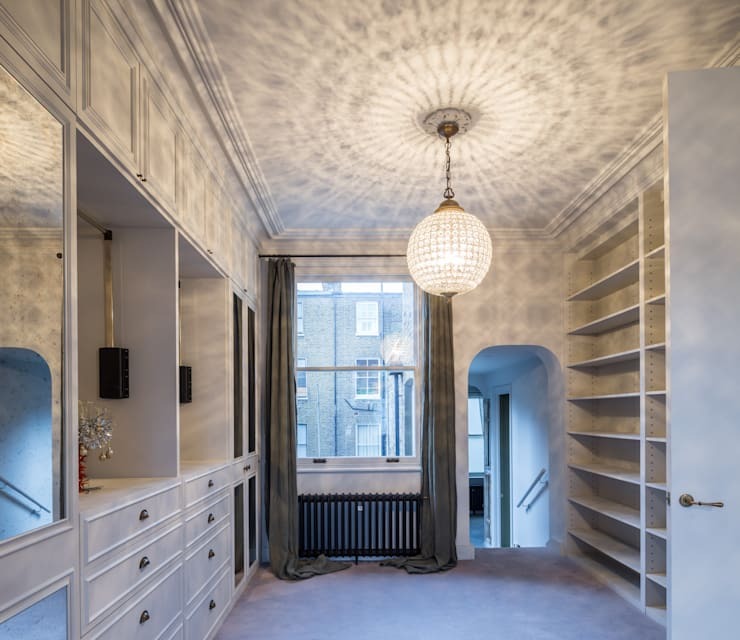 Here, in the walk-in closet, an ambience of luxury is experienced, with a grand ceiling chandelier (covered in crystals) and beautifully detailed closet doors and –handles to boot. Must be the classic style, then! 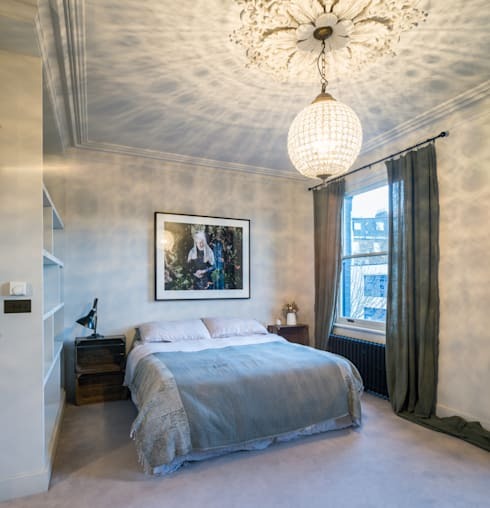 An identical chandelier appears in the main bedroom, forming a connection and relationship between this space and the walk-in closet. White and grey tones reign supreme, creating an ambience that is serene, soothing and quite classic. This third design style has been executed to great effect, showing not only the ingeniousness of the professionals, but also how you can dare to be different and creative in tackling your interior design projects. Speaking of interior design, let’s take a look at: 7 tricks to give your bathroom a hotel look.